The Indian Institute of Foreign Trade has announced the IIFT 2019 entrance exam date. 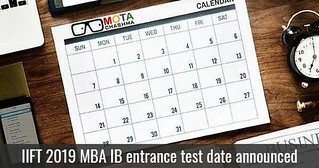 On 2 December 2018, IIFT exam will be held in a paper-based mode for admission to the MBA in International Business programme. Based on the candidate’s score in IIFT 2019 exam, they will be shortlisted for the pre-admission process. The mode of admission to IIFT will be equally applicable for admission to all the three campuses, which are - Delhi, Kolkata and Kakinada. Notification regarding IIFT application process, admit card and other details are yet to be announced. However, candidates can expect the IIFT registration to start from the last week of July 2018. As mentioned above, only the exam date has been announced. However, the table below provides the list of IIFT important dates prepared on the basis of the previous year’s schedule. Once the candidates have gone through the IIFT eligibility norms, then they can start filling the application form. It must be noted that IIFT application form 2019 will be available online only. However, the fees can be paid via online as well as offline mode. Also, while filling the IIFT registration form, candidates must make sure that they enter all the details correctly. Incomplete IIFT application forms will be rejected. The IIFT exam will be held in a pen-paper based mode for admission to the MBA International Business programme of the institute. The language of IIFT 2019 will be English only and it will contain around 115 to 130 MCQs, based on topics like English Comprehension, General Knowledge, Logical Reasoning and Quantitative Analysis. The total number of questions in IIFT varies every year. Candidates appearing for IIFT 2019 must note that for every wrong answer, 1/3 marks will be deducted. To apply for IIFT MBA (IB) 2019, aspirants must make sure that they fulfil the required eligibility norms. Failing to meet any of the IIFT eligibility criteria will lead to cancellation of candidature on or before the admission rounds.